Ten Tips is our ongoing off-season series for those snowy or rainy days when you’d rather be on the water, but you’re forced to sit inside and reflect instead. Why not use that time to become a better angler? OAT ANGLING is a core component of our sport, but it’s also an acquired skill. In recent years my time aboard watercraft has grown to include smallcraft, drift boats, rafts, skiffs, pangas and even large center console bay boats. The following are ten observations that may not have occurred to you, which will not only make you a better angler–but perhaps more importantly will also make you a better boat companion. #1 Respect other anglers’ space! This is one of the most common things new boat anglers fail to do, and unfortunately it really gets on the nerves of more experienced fishermen and women. Imagine you are in a standard pram-configured craft, such as a three-man drift boat or raft. 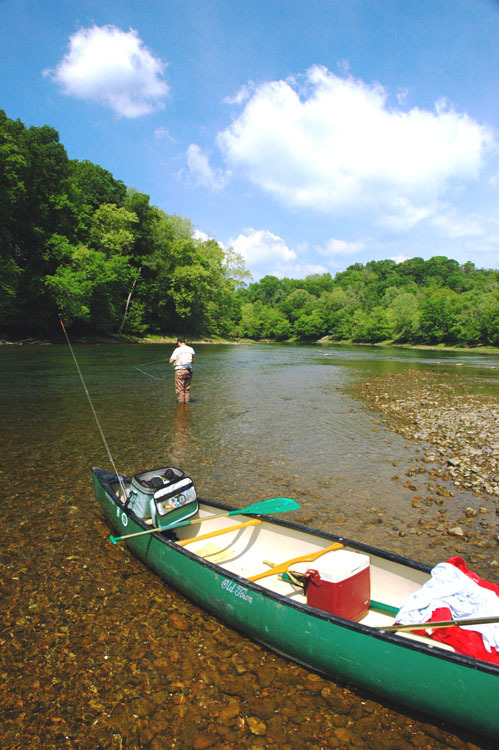 You are in the back seat, trying to work a seam along a bank for trout or stripers, but you’re constantly having to wait on the front angler to pick his fly up before you can cast. Worse still, the front angler’s line keeps fouling the oars on the bank-side, necessitating a lot of wasteful stopping by the oarsman to untangle. The front angler here is guilty of failing to respect his boatmates’ space. 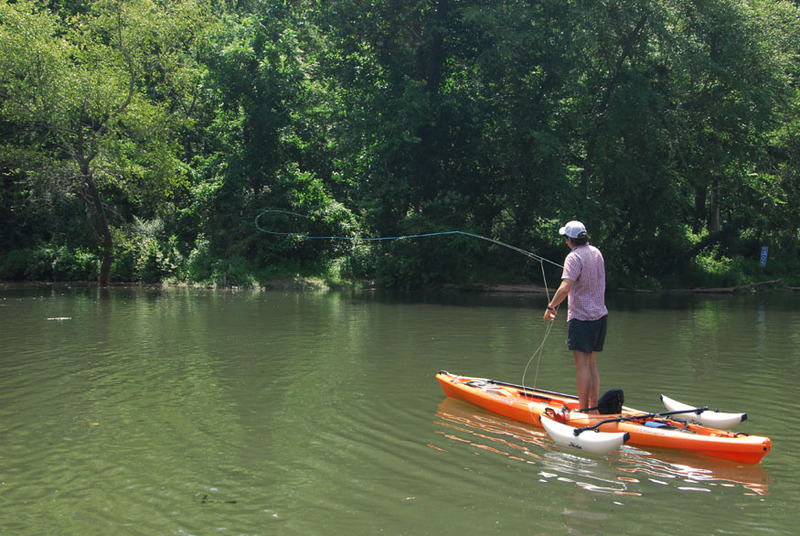 Whether drifting flies, swinging streamers, or stripping big meat from the banks, the front angler’s zone ends at the oars. He should never allow his line or fly to cross the imaginary center line of the boat, because that is where his rear-seat companion’s zone starts. The best way to respect others’ space is to cast, ideally in synchrony with the rear angler, at a 45 degree angle ahead of the boat. This will allow the front angler’s fly time to sink into position (if streamer fishing) before being stripped back and also will allow the angler (if nymphing or dry fly fishing) to make any necessary mends to keep a drift going. When drifting nymphs or dry flies, it is the oarsman’s job, where possible, to slow the boat with constant backrowing so as to keep the front angler’s flies drifting ahead of the oars. The rear angler should follow the same principles and respect the front angler’s space by starting at the centerline and working back. The principle of sharing space also applies to wading anglers. You’re in the boat; you have miles of water and a multitude of opportunities to cast and catch fish. Ninety percent of the time, you are better situated to cede a prime lie to a wading angler than he is to do you the same courtesy. This is a golden rule scenario: always remember, you may be that wading angler the next time. 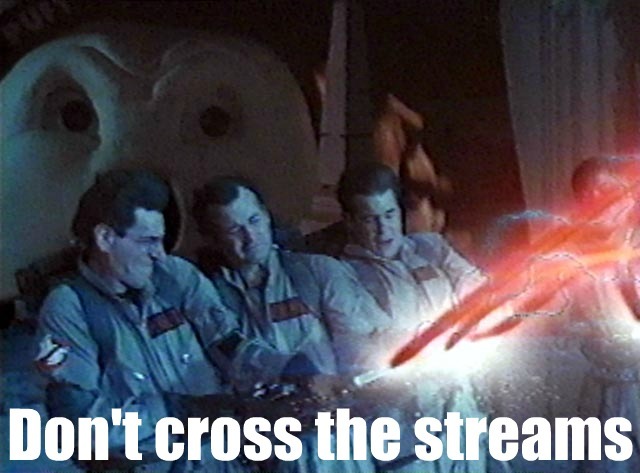 #2 Don’t cross the streams! We use the classic line from Ghostbusters in my boats to remind anglers to always aim casts in the same general direction. Think of this: a front angler attempts a cast to well to his left, while the back angler casts well to his right–this would create a huge gap between where the flies land, right? That’s true, but unfortunately it also means their backcasts will cross. Inevitably this will result in tangles. 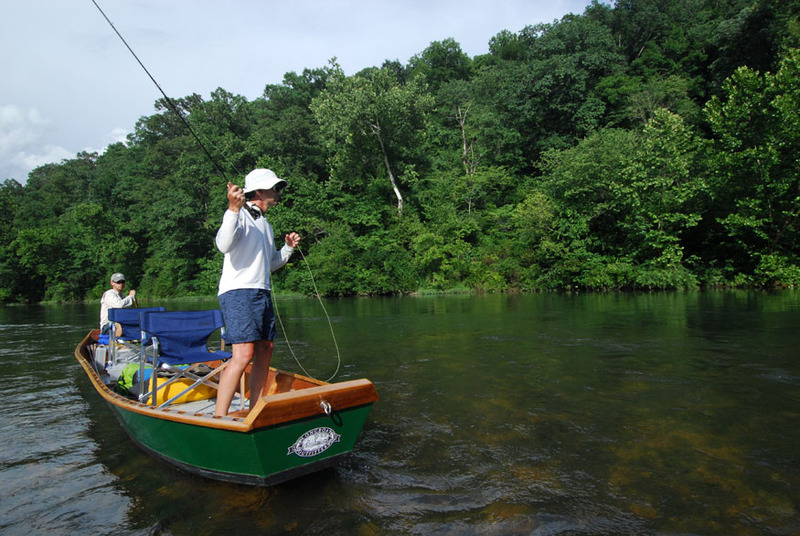 Whenever possible, anglers should cast at the same relative angle from their position in the boat (most typically, forty five degrees downriver, towards the bank). Not everyone will respect this rule. The best medicine if you find yourself in a boat with a constant stream-crosser is polite but firm communication. 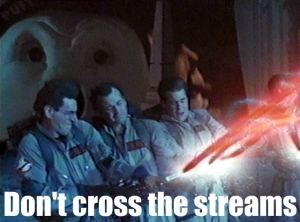 The same goes for avoiding becoming a stream crosser: if you think you might be about to cross the streams, announce your intentions to the other anglers: “I’m going to cast at that log over there, give me a second.” That will let the other angler and the oarsman help you to avoid creating snarls. #3 The boatman is working; you should too. Boat owners worldwide know that just by virtue of owning the boat, they are likely to be the ones rowing or poling more times than not. That’s fine; most of us buy boats in the first place so we can enjoy time on the water with our friends. Many boat owners, just by being dedicated to the sport enough to own a boat in the first place, will find themselves in a teaching role as they show new anglers the ropes. If you ARE that angler, always remember, the boatman is working his tail off to get and keep you in position, fighting wind, back-rowing or poling, all to serve your needs. 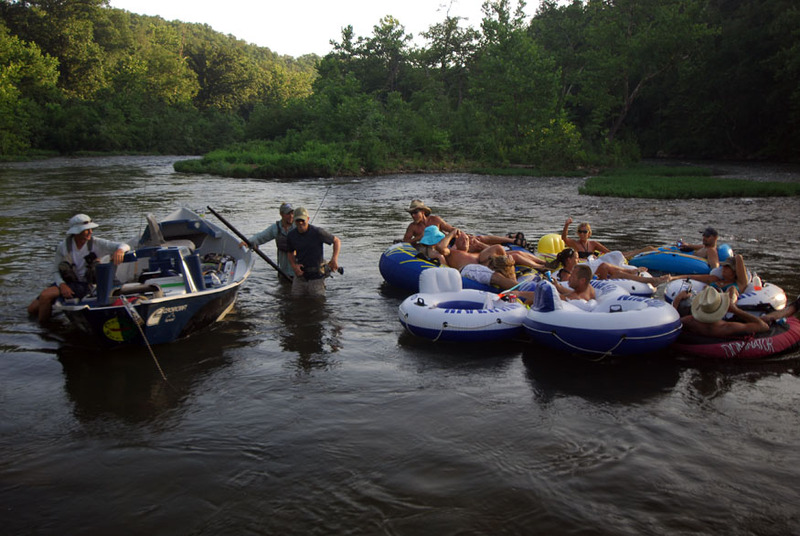 It is a poor reward for such hard work to see an angler who really just wants to lollygag around the front deck, or swivel around in his chair and drink a beer or six on the way downriver. If you come to the water for relaxation time in a fishing boat, volunteer to steer. After all, your buddy is dedicating his valuable fishing time to this trip too. #4 Avoid gear explosion syndrome. Many of us go fishing with a wagonload of equipment on our persons. The temptation, when someone offers you a boat ride, is to bring all the stuff you usually do and then a little extra too. After all, the boat’s pretty big, right? Wrong! Storage space in boats is typically at a huge premium. Compartments tend to be clogged up with state-mandated (and often unnecessary) equipment like life jackets, fire extinguishers, spare oars and anchors, not to mention lunch, snacks, water, beer, and the guide’s own equipment. Few things are more annoying to other boat anglers (or guides) than seeing a client or buddy spill the contents of three bags, an extra rod tube, a vest and spare clothing all over the decks or clear spaces. Remember, fly angling requires somewhere to put your line, and most boats are especially hard on the guy in the back when it comes to line management. #5 Stealth is your friend. Boats offer some of the best platforms for angling, period, but they particularly excel in the stealth game. Whether you’re poling for redfish, carp or permit, or trying to sneak up on a big brown trout, remember that the fish CAN HEAR YOU COMING. Sound actually doesn’t transfer from air to water all that well, meaning speaking in low voices is usually okay, but it does transfer extremely well from boat hulls into the deep. Clanging lockers shut, dropping metal or hard objects, creating a rattling pile of empty beer cans — all of these announce your presence just as if you went charging into a hole pushing wake ahead of you. The absolute most obnoxious maneuver–and anglers who do this tend to get noticed and reported to other groups–is the guy who hogs a hole until just the moment when the upriver group has grown frustrated enough to try to pass, THEN the hole-hogger moves on. This is a great way to both insure the upstream fishermen never get fresh, rested water to themselves, and also to get your tires slashed. Don’t be that guy! #7 Get with the program. Most of the time, a fishery will call for certain tactics, whether it be running nymphs, chucking huge streamers, or tossing hopper-droppers. When there’s more than one angler in the boat, the fishing works best and is most productive when everyone is at least trying to do things that are complimentary of each other. Lots of guides on their days off and advanced anglers who may have caught tons of little fish already will prefer to throw large streamers at the bank in the hopes of luring out a big fish, versus running nymphs in an attempt to catch more small fish. If the majority of the anglers in the boat plan on chucking streamers, you should go along with the program. This is because of the difficulty of keeping a drift boat slowed enough to position the streamer angler to hit prime lies while ALSO trying to keep the boat moving with the current to achieve the nymph angler’s best dead drift. Realistically, the boat as a group should elect to fish one way or another to maximize their collective chances. #8 Help your guide help you. Skiff angling, whether for carp or permit or anything in between, is almost always a visual game. The vast majority of anglers standing on the front deck of a boat will cede the job of searching for and spotting fish to their guide or buddy back on the poling platform. The rationale is usually that the poling man is on a higher platform and thus is better positioned to see fish, and after all he is usually also better able to spot a fish when he does see one. Consider that most skiffs are at least 16 to 18 feet long if not longer. You as the front deck angler are considerably closer to the target than the poling platform is, even if he does have a more elevated view. Don’t punt on the task of trying to see fish–instead, learn to look through the water rather than looking at it. 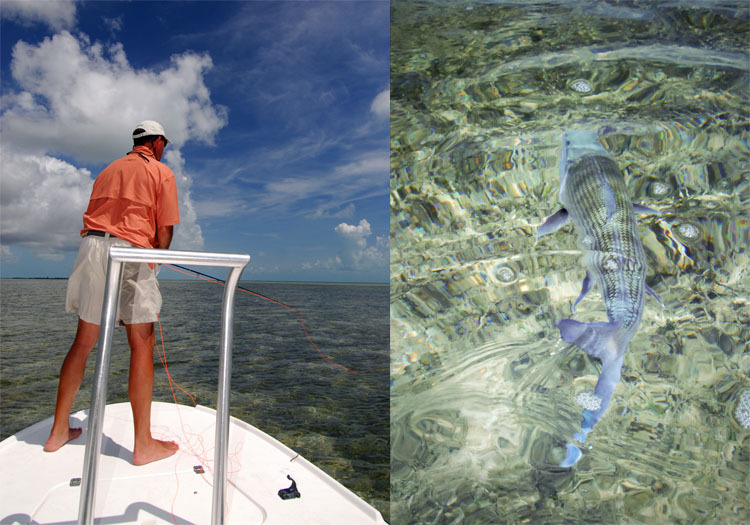 Seek out slick “water windows” in current or tidal flow to see to the bottom, and mentally focus on looking at the bottom of the flat in order to pick out the dark shape of a fish moving across it. Working as a team to spot fish is far better than leaving all the heavy lifting to the guide. This is truly a situation where two heads are better than one. Many new boat anglers fail to appreciate the difficulty of running a shuttle–particularly if the shuttle run in question involves heavy traffic (as mine usually does in the Atlanta area). The typical way a shuttle system works is that the boat angler(s) and boat owner will meet at the top of a given float, launch the boat, load it with gear, then leave a guardian to keep an eye on the equipment. The boat owner will then drive his rig and empty trailer to the take-out at the bottom of the float, while one of the anglers follows in his vehicle. They will leave the empty trailer, still attached to the boat-owner’s rig, at the bottom, then drive together back to the put in in the angler’s car, thus meeting up with the guardian angler and beginning the float together. At the end of the float the boat will be re-united with the trailer and all passengers will ride back upstream to the put-in where the anglers can retrieve their vehicle(s) and depart for home. In places without paid shuttle services, this is a best case scenario. 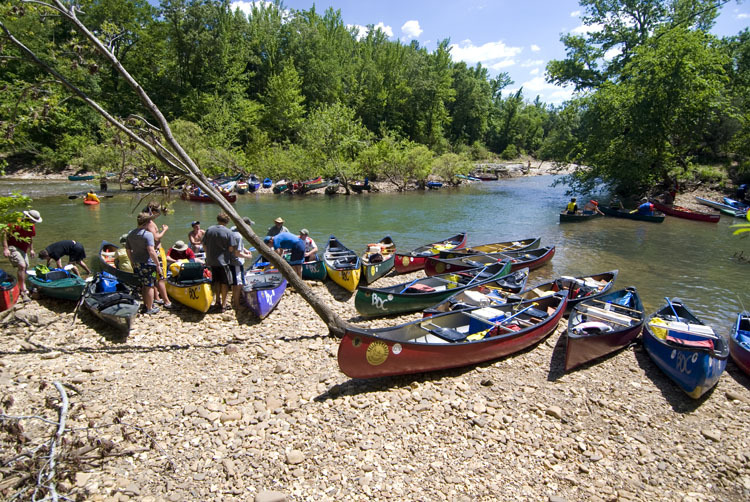 However, many anglers would prefer to meet the boat and trailer at the bottom of the float, then ride in the guide’s rig with his trailer to the top so they can float back to their car–while this is easiest on the angler, it leaves the guide in a pickle at the end of the float, since he still has to get back to his truck and trailer at the put-in, and may need to leave boat and gear unattended while he rides in a taxi or an Uber back to his own rig. I’ve handled shuttles both ways. I actually carry a long chain in my drift boat to allow me to tether it to a tree, all lockers locked up, while catching a ride or Uber-ing back to my rig at the put in. The problem with option two is that the boat owner winds up handling all shuttling duties by himself while also assuming the risk that his boat will be stolen or broken into (and I’ve seen both happen) while he is away. If you are offered a boat ride, think the shuttle through in advance, and offer to run the shuttle with the boat owner. It’s the most humane way to operate and also the best way to make sure you get invited back. This tip is simple, and yet so important I’ve already written an entire magazine article about it. When fishing from small craft of any kind, your success as an angler will be greatly improved if you simply stand up. Every foot of elevation you can safely add to your position will greatly increase the horizon at which you can see fish, and also will allow you to make long and stealthy casts to reach those fish. If you are fly-fishing from a seated position when you could safely stand, you are doing it wrong. These tips, although by no means exclusive, should help you not only improve your angling success, but also make you more likely to get invited back on your next boat trip in the bargain. Keep an eye on this section as the off-season continues for more Ten Tips! 3 Responses to "Ten Tips on Angling from Boats"
The desire to put fish in the boat trumps fishing etiquette among too many young guides, especially in difficult conditions. “Hole hogging” has become more common place as pressure increases on our rivers. Personally I believe the traditions of fly fishing and comradeship are being lost to many. Competition for business, fish and ego hurts us all and helps to deminish the industry. After all, it’s just fishing! Good read. Moving from East to West in the last decade forced a steep learning curve on this stuff. I’m often guilty of gear explosion as I like to bring three rods in the boat, streamer, dry, nymph, loaded up. Way too many times I’m prepared for a streamer day and its all noses on the banks…or vice versa. Regarding shuttles, I’ve started carrying a blank check tucked away in my wallet. Most services will take local checks as payment and its embarrassing being out of cash when it’s your turn to pay.